After "Lassie", Elizabeth again appeared in a minor role in the Roddy McDowall vehicle "The White Cliffs of Dover", and then in another minor role in 1944's Jane Eyre. Watch Elizabeth Taylor in Jane Eyre here. After a determined campaign, she and her stage mother finally persuaded the powers-to-be that she could play the coming-of-age star "Velvet Brown" in the film "National Velvet" opposite Mickey Rooney. Clarence Brown was the director, and Pandro S Berman the producer. Anne Revere, won the Best Supporting Actress Oscar for her part as Velvet's mother. Cast as a co-star in this film, she rocketed to fame in 1944, at age 11, as "Velvet Brown". What that 1949 article doesn't state, is that because of her sudden national fame, Elizabeth would never be able to live a normal childhood. She was in danger of being mobbed anywhere she went. Box sleeves today make Elizabeth Taylor the "star" of this film, but she was not the first billed. The original film credits boldly proclaim "Starring Mickey Rooney" on the first star page by himself, and on the second page "with Donald Crisp, Elizabeth Taylor". It was essentially a Mickey Rooney vehicle, even though Elizabeth played the central character. Box sleeves today elevate Elizabeth to first position, or co-starring role, but that is not how it was promoted, since she was an unknown actress at the time. 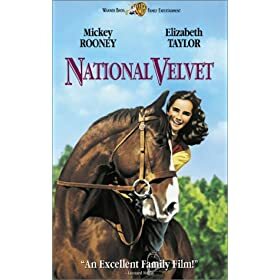 Watch "National Velvet" on YouTube, and then buy it! Elizabeth was next put into the 1946 silly, sentimental piece of nothing called "Courage of Lassie" (Trailer). The only interesting thing about the picture was that it also co-starred Frank Morgan, better known to today's viewers as the wizard in "The Wizard of Oz". Elizabeth Taylor in 1947's "Cynthia"
Slightly more interesting was her role in 1947's "Life with Father", starring William Powell and Irene Dunne, a sort of family-life comedy where the father blusters around while the mother subtly manipulates things to her advantage. (Watch Part 1 here) Elizabeth's part is merely supporting and not large at that. The film is a bit of family fluff. 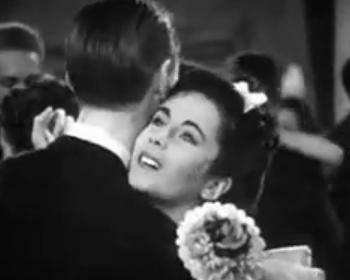 Next for Elizabeth was her "first movie kiss" in 1947's "Cynthia". (Trailer) This film is evidently a coming-of-age movie about a girl's first dance, first boyfriend, etc. Elizabeth was 14 or 15 at this time in real life. Kitty Kelley quotes J. D. Salinger at this time as stating that Elizabeth was "... the most beautiful creature I had ever seen in my life." During this time we can determine exactly where Elizabeth was living, as in the 1946 California Voter's Registration in Beverly Hills I find : "Francis L Taylor, Mrs Sara S Taylor, 703 N Elm Dr" both listed as Republican. They are still listed there through 1954, still both listed as Republican.